I’ve been talking a lot lately about moving forward. Pushing onwards, growing and learning. Over this past month I’ve visited a new country, and even a new continent. I have gone to places that I only imagined that I would visit. Antarctica is still sinking in and almost feels like a dream. It was absolutely incredible. But as I’ve pushed into Brazil this past week I am starting to face some of the challenges I was confronted with when I started traveling. I look back to the first time I backpacked alone and the stress of visiting a bank, and the reward of getting through tough situations by learning. Over the past 18 months or so I have been living in the shelter of my ability to speak Spanish, but now that I’ve crossed into Brazil, I am re-learning, and it is exciting. It actually draws me back to memories of my first true travel adventure which was to Japan. When I was only thirteen years old I managed to “trick” my parents into letting me go on an exchange to Japan for a summer. The experience changed my life for ever, and will always remain etched on my mind. People ask me all the time which city is my favourite, and I always throw the city of Kyoto in the mix. You see, Kyoto managed to stimulate my imagination like no other city I have ever been to. It showed me to the point that I realized the world was a very different place than what I knew. But most of all Kyoto taught me to never stop exploring like a child. Kyoto is historic, it is beautiful, and it is charming. But the thing I remember noticing more than anything was the sense of peace and calm that existed in the city. From the rush of a busy street a path leads to the tall shrubs of bright green and lead visitors into lush parks. It is almost as if one is crossing through the wardrobe from the Chronicals of Narnia. The high shurbs act as a gateway for another world within the city. 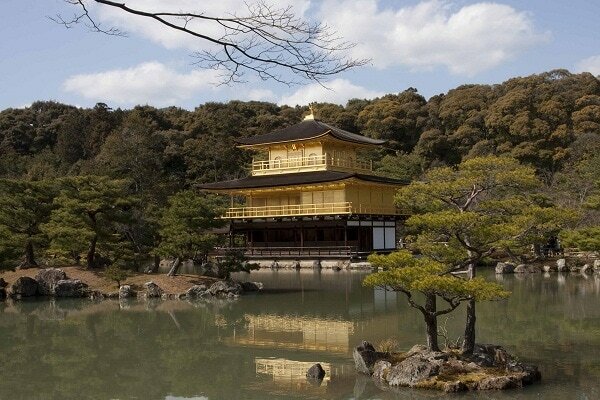 Inside the park, a picturesque lake puddles in the humid air and gives a home to a great golden temple, that seems more likely to be spotted in the pages of fairy tales than a city of this size. It is amazing that a place has managed to etch itself into my memory like Kyoto has. I will go back to Kyoto someday, and I will explore like I did when I was thirteen. I will play with the electronic toilets in my Kyoto hotel and I will walk through the gardens like I did the first time. I will stand in awe as I look out at the Kyoto Imperial Palace and I wonder, though, if it will be the same as it was the first time I wandered places like Maruyama Park? Do you have any travel experiences where you’ve gone and returned years later? How did they feel upon your return? I studied abroad in Mendoza, Argentina and absolutely fell in love with the city and country. I returned 3 years later after graduation during a 3 week trip through South America. It was so much fun to take the bus to my old University, visit my old host family and just walk around my old neighborhood. I moved to Buenos Aires, Argentina 7 months ago because I wanted to soak up more of the language and culture. You’re in Brazil now? You really need to swing by Buenos Aires! Any plans to visit Argentina? Rease… I’ll be back in BA in a couple weeks! I must have skipped over the part where you said you were living there haha. I’ll probably be there for a good 5 days or so. I still have yet to write about my trip to Kyoto, I loved it there and it was everything that Tokyo wasn’t but all in a good way. It really is a unique city, and like you said has itself deeply rooted in Japan’s history and lack the crazy on the go, go, go rush of Tokyo. But still remains an active city with people always on the move. The train depot alone offered great views of the city, but I never made it to the Kyoto Tower. Greece is somewhere I visited a lot as a child, and have revisited a little with Z, it’s also a place where I have a big connection to the history. I spent time in Eastern Europe before and around the fall of the Iron Curtain, and I’d be fascinated to go back to Poland, where part of my family originates, to see what it’s like today, as a full-fledged capitalist European economy. There’s nowhere that stands for me like Kyoto does to you, however. My teenage exchange was to France. Much less interesting. Oh, I love Kyoto! To be honest I’ve not yet been back to countries that I’ve visited, but this year I’ll be re-visiting two: Thailand and South Africa. I’m curious to know how both countries will be second time around.